A list of music videos I turn to when I’m in need of a creative boost. To be used for worldbuilding, brainstorming, and a general appreciation of that beautiful brainspace where the audio and visual collide. A group of children are called to their leader by the beat of his drum. The children weave their way through rocky Icelandic hillsides and hot springs. It is lovely. An electroclash mashup between the Neverending Story, the Lion King, and maybe…the original Planet of the Apes? A collaboration between Kate Bush and Terry Gilliam. With actor Donald Sutherland as Wilhelm Reich (inventor of the orgone energy accumulator) and Kate Bush as his young son, Peter. 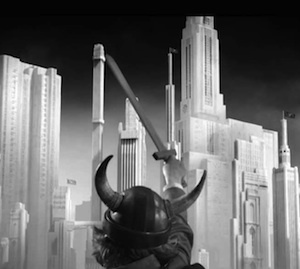 An adolescent boy battles looming monster hoards on his way to a symbolic Emerald City. Bonus: boss battle, gratuitous flinging of dirt, a flying ship. A short horror film by Mexican American horror director Rodrigo Gudiño. Music by electronic/darkwave music group Johnny Hollow. A surreal, technicolor voyage inspired by the early 1900s silent French Film, A Trip to the Moon, by Georges Méliès.